This project is geared towards the development of catadioptric (lens + mirror) imaging systems with unusually large fields of view. One important design goal in catadioptric imaging is choosing the shapes of the mirrors in a way that ensures that the complete imaging system has a single effective viewpoint. The reason a single viewpoint is desirable is that it is a requirement for the generation of pure perspective images from the sensed images. In the first part of the project, we have derived the complete class of single-lens single-mirror catadioptric sensors that have a single viewpoint. We have derived expressions for the spatial resolution of a catadioptric camera in terms of the resolution of the cameras used to construct it. In addition, we have analyzed the defocus blur caused by the use of a curved mirror in a catadioptric sensor. In the second stage of the project, a framework was developed for the design and analysis of single-viewpoint catadioptric cameras that use two or more mirrors. The use of multiple mirrors permits folding of the optics which leads to more compact camera designs than ones that use a single mirror. A dictionary of camera designs that use two conic mirrors has been created. We have shown that any folded system that uses conic mirrors has a geometrically equivalent system that uses a single conic mirror. This result makes it easy to determine the scene-to-image mapping of a conic folded system. Over the course of this project, we have built several prototype cameras, each one designed to meet the needs of a specific application. Some of these prototypes have been turned into commercial products by RemoteReality Inc. Some of the images and videos shown on the page are courtesy of RemoteReality, Inc.
Panoramic Vision, pp. 103-119, R., Springer-Verlag, Apr. 2001. Panoramic Vision, pp. 39-71, R., Springer-Verlag, Apr. 2001. "A Theory of Single-Viewpoint Catadioptric Image Formation,"
Vol. 35, No. 2, pp. 175-196, Nov. 1999. Vol. 2, pp. 217-223, Jun. 1999. "A Theory of Catadioptric Image Formation,"
"Generation of Perspective and Panoramic Video from Omnidirectional Video,"
Some interactive gallery pages may require Adobe Flash in order to view the images. 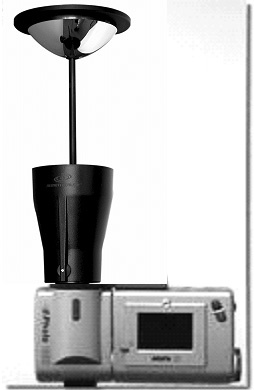 This camera was developed by RemoteReality based on the technology developed at the CAVE laboratory. It uses a parabolic mirror and a telecentric lens. 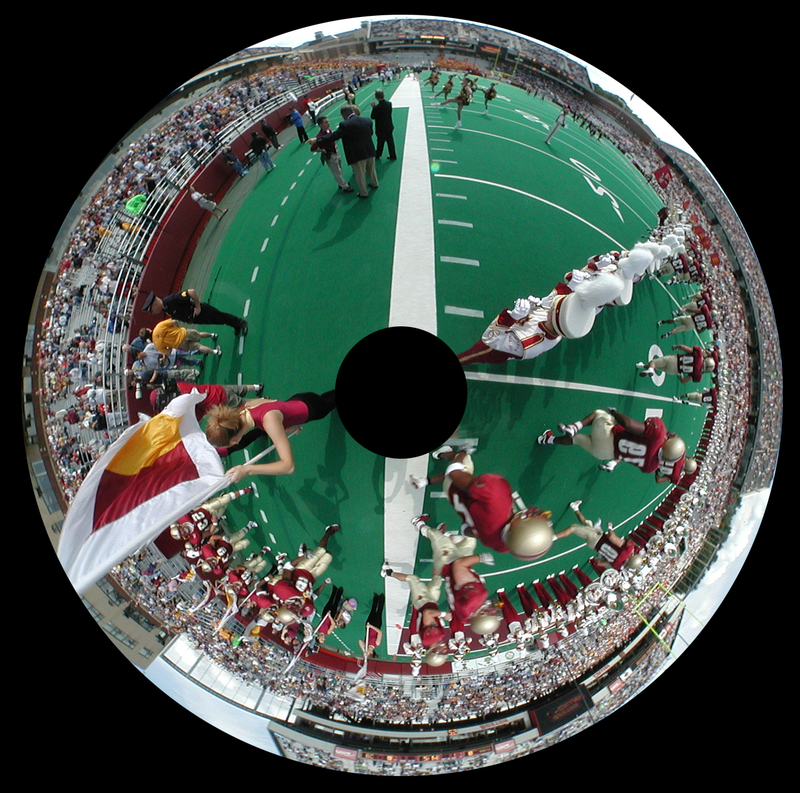 This is a raw 360 degree image captured using the OneShot camera. As one can see, the scene is highly dynamic and it is not possible to capture a 360 degree image of such a scene using the traditional approach of mosaicing a series of images taken at different instances of time. The captured donut-shaped image is mapped to a spherical panorama. Once this is done existing software tools like QTVR can be used to generate perspective views and navigate around the complete field of view. Another example of a captured image and the corresponding spherical panorama. In this video a 180 degree catadioptric camera is attached to the back of a truck. The panoramic video produced by the camera is presented to the driver who gets a full view of what goes on behind the truck. This video clip was captured by Terry Boult at the University of Colorado, Colorado Springs, using a water-proof enclosure for the 360 degree camera. In this video, a user wears a head-mounted display to experience the 360 degree underwater video shown in the previous clip. As the user looks around, the appropriate perspective views are computed and presented to the user via the head-mounted display.